Edible flowers, either harvested from your own garden or purchased from the farmer’s market, can add color, whimsy, and flavor to the seasonal table. Many are fairly easy to grow and are abundant now as spring moves into summer. They can be used fresh as garnish, made into syrups or cordials, candied into crystalized gems, frozen into ice cubes, or dried for tea. Among them you’ll find an array of rich colors, surprising flavors, and interesting textures beyond the well-known pansy, rose, and nasturtium. When adding flowers to recipes, there are few rules to follow: Always positively identify any plant part before consuming. Do not assume a flower is edible just because it smells delicious and looks tasty! Also, harvest blooms in the cool hours of the morning or evening, and wash and dry them well before consumption. In general, only eat the petals, discarding the sepals (outer leaves), as well as the carpels and stamens (the inner reproductive parts). These will often give a bitter or soapy flavor to your dish. A few exceptions are the very small florets of otherwise large umbelliferous racemes (rounded flower clusters that radiate from a central point) or corymbs (flat-topped flower clusters) such as cilantro, yarrow, and sweet alyssum (see photo). Sorrel (Rumex acetosa) is a perennial garden herb that has a bright and acidic flavor due to oxalic acid in the leaves. It is best harvested in the spring before it becomes tough and bitter. If you cannot source crème fraiche, sour cream is an appropriate substitution. With the addition of grilled shrimp or chicken, this hearty salad performs as a main entrée. Use a mix of edible flowers, including both sweet and spicy selections like chive blossoms, Brassica flowers, Dianthus, Calendula, and rose petals (see the list below for more options). Place the crème fraiche, sorrel, garlic, anchovies, oil, lemon juice, and salt and pepper in a medium bowl. Using an emersion blender, puree the ingredients until they become creamy and a consistent green color. (Alternatively, use a food processor and blend until the texture is smooth.) Taste and adjust the amount of salt and pepper according to preference. Place the greens in a bowl and toss with the dressing, adding 2 to 3 tablespoons at a time to coat the greens. Add the chopped strawberries and flower petals as garnish and serve immediately. If you have any leftover dressing, it is excellent used as a dip for radishes, baby carrots, and fresh asparagus spears. 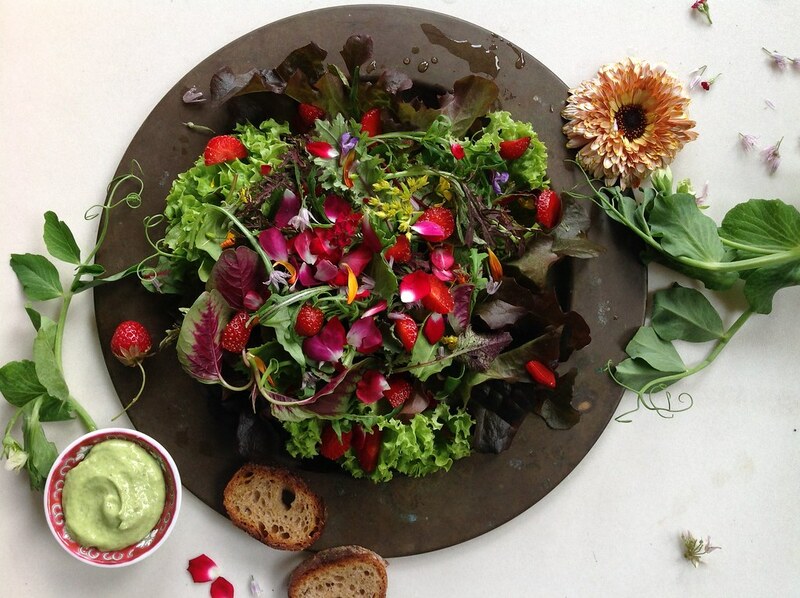 Sorrel Caesar salad with fresh strawberries and edible flowers. Photo by Sarah Owens. 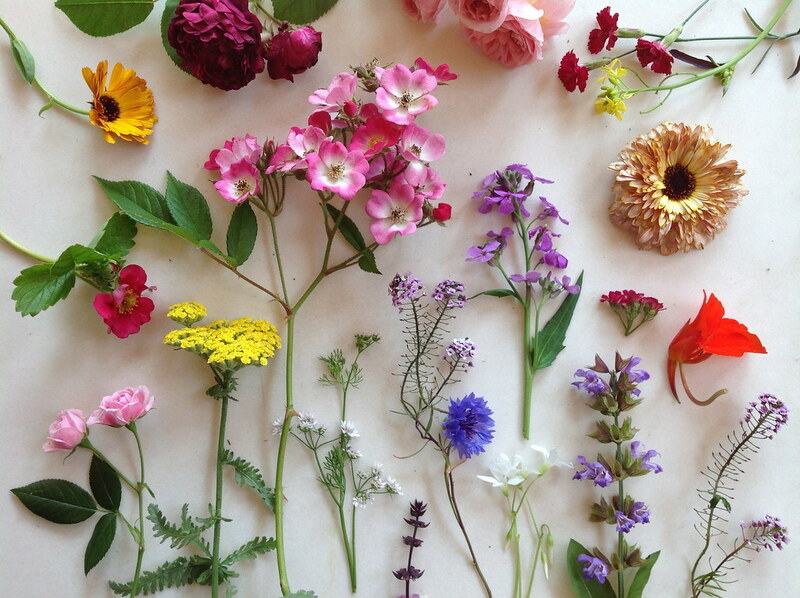 Clockwise from top left: Calendula ‘Pacific Beauty Series’, Rosa ‘Alice Vena’, R. ‘Leander’, Dianthus ‘Vampire’, Brassica juncea, Calendula sp., Achillea ‘Pomegranate’ (yarrow), Tropaeolum sp. (nasturtium), Lobularia maritima (sweet alyssum), Salvia officinalis (garden sage), Hesperis matronalis (dame’s rocket), Oxalis sp. (wood sorrel), Centaurea cyanus (bachelor button), Ocimum basilicum (Thai basil), Coriandrum sativum (cilantro), Rosa ‘Mozart’, Achillea ‘Moonshine’ (yarrow), R. ‘Jeanne LaJoie’, Fragaria ‘Lipstick’. Photo by Sarah Owens.